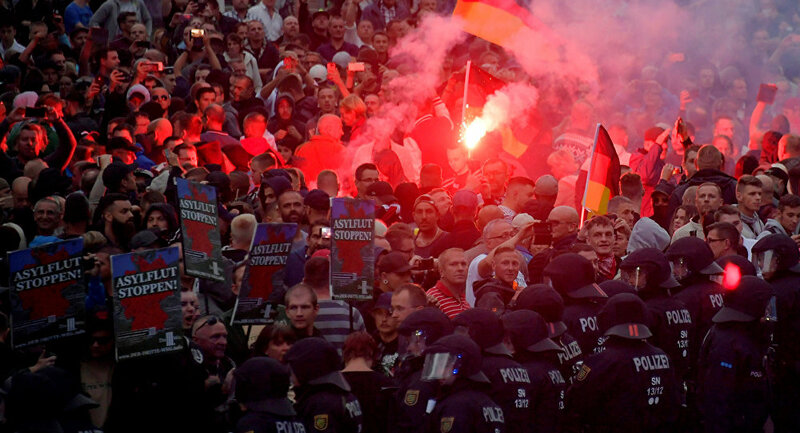 According to local police, 18 people have been injured and hundreds have been detained during protests in the Saxon city of Chemnitz following the death of a German citizen Daniel Hillig, who was stabbed to death on August, 26, allegedly by migrants from Iraq and Syria. German Interior Minister Horst Seehofer said on Monday that the head of Germany's domestic intelligence agency (BfV) Hans-Georg Maassen should explain his doubts about videos from the city of Chemnitz. "We are waiting to see what he [Maassen] has to report to us. Everything else will be dealt with then… The second thing is the veracity of the videos. Mr. Maassen has said he doubts the videos are real. He must have reasons to reach this conclusion," Seehofer told reporters, addressing the recent comments by the BfV head. Maassen claimed earlier that he "shared the skepticism towards media reports of right-wing extremists chasing down [foreigners] in Chemnitz," adding that it could be "deliberate misinformation," broadcasted in order to distract the public's attention away from the murder. The statement drew a considerable amount of criticism from politicians in the country. The videos Maassen was referring to, showed people chasing foreigners and threatening to attack migrants. Those videos were filmed during the protests in Chemnitz, according to the German media. Commenting on the demonstrations, police reported that at least 4,500 people had gathered at the rallies in the city against the German government's current migration policy.